Alien Ocean is Crushed Out’s most definitive, cohesive, fleshed out album to date. Frankie dubs drunken lap steel, bassy analog synths, electric piano and hammond organ, while Moselle brings her most inventive and passionate performances. Frankie's signature shimmering clean to ripping fuzz guitar tone dances from 60's surf to roaring cave creature. 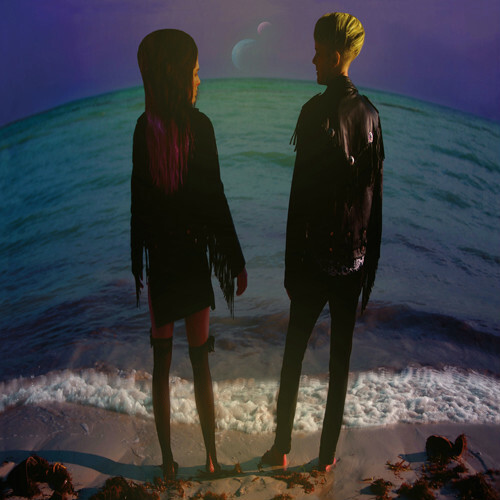 Alien Ocean tackles themes of order & chaos, communication breakdown, alienation, love, personal freedom, human contradiction & consciousness while keeping it heavy, fun and wet. Crushed Out hit the hot tar this Fall for a full North American tour. Look out for their live show featuring an immersive stage world complete with electric palm trees, black flamingos and much that you’d expect to find at the shores of an Alien Ocean. This green vinyl limited edition LP contains both a download card and a lyric sheet.